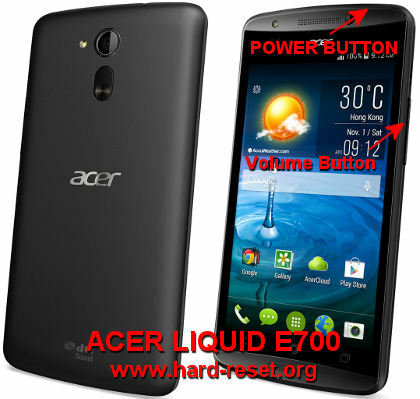 How to Easily Master Format ACER LIQUID E700 (TRIO) / E39 with Safety Hard Reset? Easy solutions for troubleshot ACER LIQUID E700 (TRIO) problems. If we are need to use some bigger screen smartphone with cheaper price then ACER LIQUID E700 (TRIO) can become the answer. This is the 5 inches smartphone with IPS LCD from Acer. The different specification compare by the same release timeline is at the simcard. The ACER LIQUID E700 have TRIO simcard slot for different operator, all of their simcard using Micro SIM type. Some people will worry about the battery if all 3 simcard on or standby together, but Acer give the answer with bigger battery at 3500mAh which is enough to use for daily activity without worry too much about the battery. What to do for Solve and Recovery if ACER LIQUID E700 (TRIO) / E39 get hang or not responding or malfunctions or hang or stuck or freezing or bricked problem? Using smartphone with big LCD screen at 5 inches wide will give more interesting experience for doing office activity or watch movie or playing games. As we know there are many applications that we can download from Google Play Store, either free download or need to be purchase. However, we should know that not all applications at Google Play Store are safe to download or install. Because Google open their applications market for all user, then sometime some users do bad things. They create some not good applications and some of them can make our ACER LIQUID E700 (TRIO) become trouble like hang or stuck or bricks or broken or blank or boot loop or LCD touch screen not responding. At this time we have to force shutdown or force soft reset or reboot or restart our ACER LIQUID E700 (TRIO) to clean the temporary files or cache at the memory. If the problem still happen after doing soft reset, then we should have to do hard reset or master format. Please remember, doing hard reset will make all important data removed or wiped from this phone, therefore we should do backup before performing hard reset. How to Force Shutdown or Soft Reset or Reboot or Restart ACER LIQUID E700 (TRIO) / E39 ? When we use our ACER LIQUID E700 (TRIO) for daily activity, sometime some problems can be happen and can make our phone come stuck or freeze or blank or hang. At this situations we should try to force shutdown or force soft reset by press and hold POWER button several seconds until the phone shutdown by itself. After the ACER LIQUID E700 (TRIO) completely turn off, wait about 5 seconds then we can continue to press POWER Button again to turn on the phone. At this time we already complete the soft reset cycle at our ACER LIQUID E700 (TRIO). At normal situations we can do soft reset or reboot anytime we want by press and hold POWER button until the pop-up menu appear and choose Turn Off or Reboot. This process is safe because it will not delete anything from our phone, so our important data will keep safe. The ACER LIQUID E700 (TRIO) will continue the step until ready to use in clean factory default. How to Restore and Reinstall Clean Android Operating system at ACER LIQUID E700 (TRIO) / E39 (Reformat) ? Because we can add more applications easily from Google Play Store, then sometime we also can download some not good applications that can make our ACER LIQUID E700 (TRIO) become trouble. At some moment maybe our operating system become damage or need to be reinstall again. However, we should know that the file source of clean factory default Android operating system has already saved safely inside ACER LIQUID E700 (TRIO) ROM. That’s why we do not need to copy or connect other gadget to our ACER LIQUID E700 (TRIO). Just follow the hard reset or master reset steps above, then the clean factory default Android operating system will be reinstall automatically. Please not that Android Kitkat is the default when our phone release from factory. But we should also know that doing reinstall or reformat will remove all important data. How to Unlock or Fix or Solutions for ACER LIQUID E700 (TRIO) / E39 forgot password code or security lock screen pattern or pin (lost password)? It is always recommended to give more security protections at our ACER LIQUID E700 (TRIO). Sometime we keep many important data or pictures or movie at our smartphone. If we does not give any security protections than it will make that data easily open by unauthorize people when they use our phone. Therefore we choose default security protection without need to install 3th party applications. By default, ACER LIQUID E700 (TRIO) have several options from security menu, but we recommended to use screen lock pattern or some users also like to use password pin protections. The problem happen when we forget about the answer of that security protections. However, we do not need to be worry, because Android already have solutions to bypass or unlock forgotten security screen lock pattern or password pin protections using Google account or Gmail username and password. Please give several time wrong answer continuously until the phone freeze or locked about 30 seconds. At this time we will find Forgot Password / Pattern button. Press this button to bring the screen show the field to enter our Google account that we have already installed before. Please make sure the Internet connection active when we bypass forgotten security protections using Google account. If we can not access Google account from our ACER LIQUID E700 (TRIO), then we have to do hard reset or master format using hardware button key. How to Improve Performance ACER LIQUID E700 (TRIO) / E39 to make run more faster? What are the usual problems which make our ACER LIQUID E700 (TRIO) become run slowly? After using this phone several moment, some users have problems with the speed which become slowly than before. Usually the common causes are because there are too many applications run in the background or some applications take so many processor and RAM resource. Basically we do not need too worry about ACER LIQUID E700 (TRIO) RAM, because it already have 2 GB RAM for multitasking, but it is still have limited. Some applications which have installed from Google Play Store will keep run in the background waiting for command or data update. Each of applications in the background will need some amount of RAM and processor resources, if there are too many of them, then the RAM and processor resources become exhausted and this problem can causes the ACER LIQUID E700 (TRIO) run become slowly. Please try to uninstall some of them, but if we want to make our ACER LIQUID E700 (TRIO) performance run faster again like new, then we have to consider doing hard reset or master format. Is That Any Secret Code for Doing Format ACER LIQUID E700 (TRIO) ? There is no secret hidden code for ACER LIQUID E700 (TRIO) to make it back to factory default. Do the options above to hard reset it. How Can ACER LIQUID E700 (TRIO) Upgrade to Android Lollipop version ? Basically the Android Lollipop is design for almost all type of Android which have minimum 512 RAM, and ACER LIQUID E700 (TRIO) already have 2GB RAM, of course it can be installed by new Android Lollipop, but unfortunately we need to wait until Acer software development release the official Android Lollipop for ACER LIQUID E700 (TRIO). We need to wait for that. [Q] In acer e39, when I press volume up hold with power button for hard reset, in screen show a another language I don’t know about this language. So please tell me how to do hard reset my phone acer e39. Can I change my phone android version, so please how to do this. [A] Hi, if your recovery menu show non English language than maybe it was build for Chinese version, therefore you will see non alphabet characters. Please try to find something with MMC word and try to choose that menu. If still can not work, then please consult with Acer authorized service center. [A] Hi, unfortunately some locked smartphone can not easily unlock, please consult with Acer authorize service center for more information. The information from this page describe about acer e39,acer e700 lollipop,acer liquid e700 lollipop,acer liquid e700 hard reset,acer liquid e700 lollipop update,acer liquid e700 reset. If you need another resource for hard reset, use search function at this homepage or find from our related posts. How to Easily Master Format LENOVO A6600 (PLUS) with Safety Hard Reset? How to Easily Master Format ALCATEL IDOL 3C with Safety Hard Reset? I connect to my network, no problem. I surf the web, listen to Spotify, all grat. But after a random amound of time the connectrion is lost. Browser and apps say that there is no internet. Strange thing is that my wifi is connected and I see data transferring. The only thing that works is shut Wifi off and on again manually and it works again. After sleep (when wifi is off) and I wake the phone up, wifi also works. – Wifi repair and connection apps. pls help me sort this bug out :-). Hi, it seems your phone need to get operating system or firmware update, please try to check it from menu Setting > About phone > Software update. If you can not find that update, please consult with Acer authorize service center, maybe they can help to update manually using their tools. Sir I have acerliquide700 mobile it is a great phone. But I have a problem my phone’s back key in touch pad not working well. Hi, we suggest you to try doing hard reset or master format. If you Acer Liquid E700 still can boot properly, then you can use setting menu. However, if you can not access that menu, then you can use hardware button combination key to reformat your Acer Liquid E700. Hi, for doing hard reset or reformat with hardware button combination key which is need when your Acer Liquid E700 get strange trouble like this, then you need to make sure Power button and Volume button work properly. Please ask Acer authorize service center for getting more help. worst phone ever I purchased on Snapdeal on looking his feature BUT it is very disappoint myself it hang to much almost 20 times in a day ,I fed up with that, even his service centre not response clearly, worsee service, 3rd class company acer. please don’t purchase it. Any news from Acer regarding Android 5 update for this device? There is no word on the internet, any official release…why there is this lack of communication from Acer? Hi, there still no Android 5 official firmware update for Acer Liquid E700. We are worry Acer will not release official firmware for this phone. I bought an acer liquid e700 after 6 months it says that the battery is error. Hiw can i fix it? Hi, perhaps the battery notification is corrupt at your Acer Liquid E700, therefore we are suggest to do hard reset or master format to restore factory default Android operating system at your Acer Liquid E700, usually it will fix battery notification as well. If the problems still not fix, then maybe your Acer Liquid E700 hardware battery is really damage and need to get replace. However, since your Acer Liquid E700 sill have warranty, then maybe you should ask at Acer authorize service center for further help or battery test. Hi, please try to do hard reset to reformat your Acer Liquid E700 factory default operating system. This will solve the problems if that situations happen because application trouble. In acer e39, when I press volume up hold with power button for hard reset, in screen show a another language I don’t know about this language. So please tell me how to do hard reset my phone acer e39. Can I change my phone android version, so please how to do this. Hi, usually the language using English, but if your Acer E39 show other language then please consult with Acer authorize service center. i have a acer e700 e39 i recently update the firmware and from that my sim card not picking up can some help me with that problem. i try changing the imel number but ntn. Hi, if your Acer Liquid E700 still on official firmware, then you should get OTA (over the air) firmware update. Some users get trouble after upgrade Android version, but usually it can be solve after doing hard reset, because some old applications may not work perfectly at new version, therefore we have to do hard reset. Please note, above steps may not work correctly if your Acer E700 are using custom rom. Hi! What to do if my sim card can’t be detected? I tried using my sim card with a different phone and it’s working. I also tried inserting my sim card in all the 3 slots but it’s still not working. What to do now? Hi, please try to do hard reset your Acer Liquid E700 to reformat the operating system to factory default. If that problems comes from software trouble, then your phone will able again to detect your simcard. Hi, usually this is happen because corrupted operating system. Please try to reinstall the OS again using menu Setting if you still can go to there, or use hardware button combination key like steps at #option 2 above to reformat your Acer Liquid E39 to factory default, so it will act again like new and you need to re-setup again from beginning. Hi, unfortunately some locked smartphone can not easily unlock, please consult with Acer authorize service center for more information. Hi, if your recovery menu show non English language than maybe it was build for Chinese version, therefore you will see non alphabet characters. Please try to find something with MMC word and try to choose that menu. If still can not work, then please consult with Acer authorized service center.